Thank you Gil! It was great working with you and it’s very rewarding when we are able to know that we were helpful in your process! Enjoy your Langston pieces! This entry was posted in LeatherGroups.com Reviews & Testimonials and tagged customer reviews, Customer Testimonial, Customer Testimonials, LeatherGroups Reviews, LeatherGroups.com Reviews, product reviews, reviews, testimonial, testimonials on June 6, 2015 by LeatherGroups. Feedback like this makes our day! 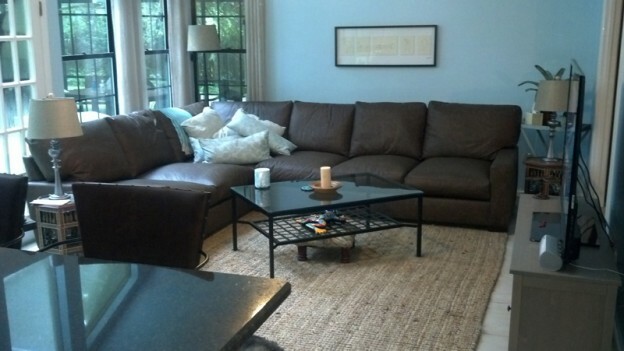 Thanks so much for sharing Kim, your Braxton Sectional looks perfect in that room! This entry was posted in Braxton, Custom Leather Order Feed, LeatherGroups.com Reviews & Testimonials and tagged braxton collection, braxton L sectional, braxton sectional, customer reviews, Customer Testimonial, Customer Testimonials, LeatherGroups Reviews, LeatherGroups.com Reviews, maxwell leather collection, maxwell leather sectional, product reviews, reviews, testimonial, testimonials on December 5, 2014 by LeatherGroups. We received our Braxton Sectional today and we love it!! We received our sectional today and we love it!! Very pleased with the entire experience! 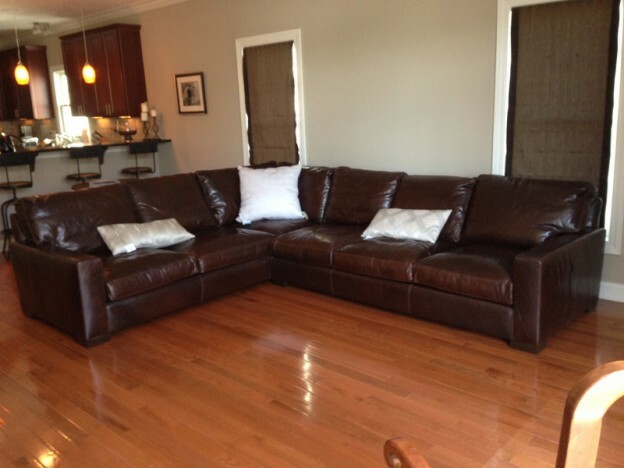 The sectional fits great in our new home, check it out! We are very pleased with the item, quality, service and delivery! Thanks again! This entry was posted in LeatherGroups.com Reviews & Testimonials and tagged 43" Deep, braxton collection, braxton L sectional, braxton leather sofa, braxton sectional, customer reviews, Customer Testimonial, Customer Testimonials, Glove, Glove Truffle, Leather Sectional, LeatherGroups Reviews, LeatherGroups.com Reviews, maxwell leather collection, maxwell leather sectional, product reviews, reviews, testimonial, testimonials on August 14, 2014 by J E.
I had searched far and wide for a ‘distressed leather’ sofa and almost purchased a sofa and loveseat combination from a big retailer. 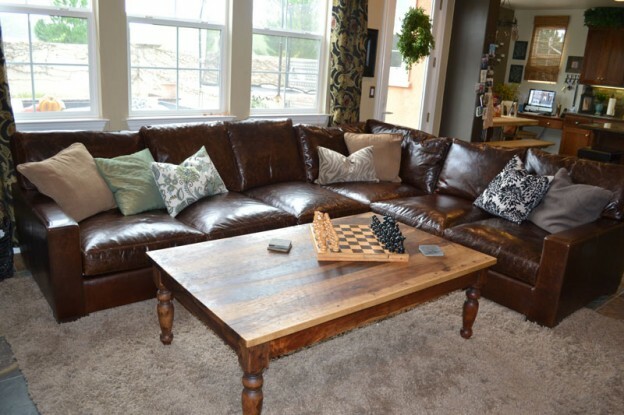 I found the Leathergroups website and immediately liked the sectionals that I was seeing on the website better than the combination that I would have spent more for at one of the big retailer sites I had been contemplating beforehand. 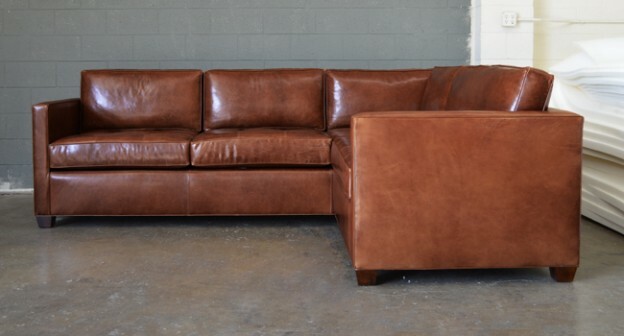 I held my breath and ordered the L-sectional in brown vintage leather online (after reading many good testimonials and reviews on the website and on Facebook). A representative contacted me immediately to verify the details of my order (i.e. that he had my chosen depth and that the L was facing the correct way). My couch was made within the shorter end of the timeframe specified (maybe even a few days early) and the same rep gave updates along the way and sent a picture of the finished product before arranging delivery. There were a few snags with delivery – the delivery company picked my sofa up a few days late from Leathergroups and canceled my delivery (in Florida) the day before it was supposed to happen. However, Jerry at LeatherGroups immediately contacted management and made sure that redelivery was arranged as quickly as possible. My couch arrived today. It was wrapped up extremely securely and the delivery guys were really fantastic about getting it into the house and setting it up where I wanted it to be. The couch looks great, is very comfortable and I’m really glad I bought it! This entry was posted in LeatherGroups.com Reviews & Testimonials and tagged 46" Deep, braxton collection, braxton L sectional, braxton sectional, customer reviews, Customer Testimonial, Customer Testimonials, LeatherGroups Reviews, LeatherGroups.com Reviews, maxwell leather collection, maxwell leather sectional, product reviews, reviews, testimonial, testimonials, Vintage Brown on July 16, 2014 by Brandi O.
I LOVE LOVE LOVE my Braxton Leather Sofa! This entry was posted in LeatherGroups.com Reviews & Testimonials and tagged customer reviews, Customer Testimonial, Customer Testimonials, LeatherGroups Reviews, LeatherGroups.com Reviews, product reviews, reviews, testimonial, testimonials on June 18, 2011 by LeatherGroups.